Natural gas in transport represents a part of a versatile system. The current European infrastructure already in place allows natural gas to flow on demand from one point to another. This means that large amount of energy could easily be supplied matching exactly the demands from users. Especially interesting is the benefit of the gas infrastructure provided to transport. 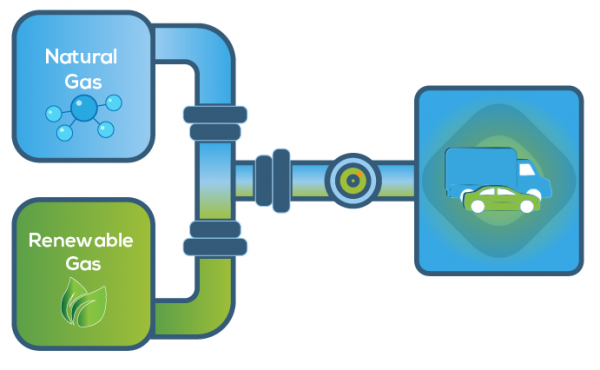 Since natural gas vehicles use the same type of gas as the one used in heating or power generation, this means that fueling stations can connect to the existing grid as a standard practice. In fact, the infrastructure of fueling stations has been long-developed in the EU28, whereby there are currently more than 3.300 CNG stations and 155 LNG stations in operation (complete list of all stations is available at: http://www.ngva.eu/stations-map/). This infrastructure serves to both private and professional users. Hence, the vehicles running on natural gas are used for different ‘mission profiles’ or, in other words, there are passenger cars, buses, vans and trucks to cover all types of road transport in Europe. Apart from its main use in road transport, natural gas has started becoming an ever-more interesting solution in maritime application where heavy-fuel oils are replaced by clean fuels such as LNG. The benefit of this system, in terms of immediate supply of fuel on demand, is further enhanced by the fact that natural gas can be stored in the infrastructure itself. This is possible due to the gaseous state of the fuel allowing for flexibility between the minimum and maximum quantities of gas flowing at any given point in the pipeline infrastructure. As such, natural gas can be blended and progressively replaced by renewable gases such as biomethane or synthetic gas, both of which drastically reduce or even eliminate related greenhouse gas emissions contributing to global warming. To make natural gas infrastructure even more valuable and beneficial to end-users in the future, more CNG and LNG stations have to be developed in the European Union. This development is in accordance with the Member State needs outlined in the Directive on Alternative Fuels Infrastructure (2014/94/EU), which sets to create Europe’s sustainable alternative fuels strategy, as well as the appropriate infrastructure. Such policy instruments, alongside with projects such as the LNG Blue Corridors (www.lngbc.eu), the latter aiming to establish LNG as a real alternative for medium- and long-distance transport — first as a complementary fuel and later as an adequate substitute for Diesel, are an important driving force towards the future development of CNG and LNG stations. 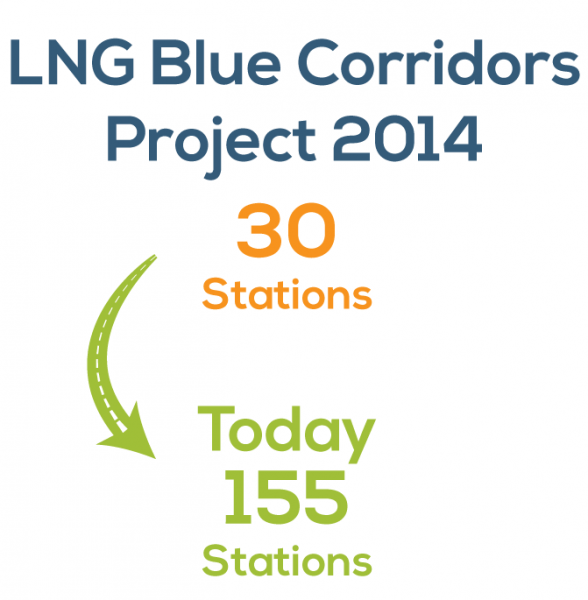 The LNG Blue Corridors project started in 2014 when there were only 30 LNG stations on the market. Due to the work done and the effort put into this project, their number has now risen to 155 stations across Europe in less than 4 years. Looking towards the future, NGVA Europe in collaboration with the European Biogas Association (EBA), has developed an industry roadmap outlining the growth of both CNG and LNG stations in Europe towards 2030. 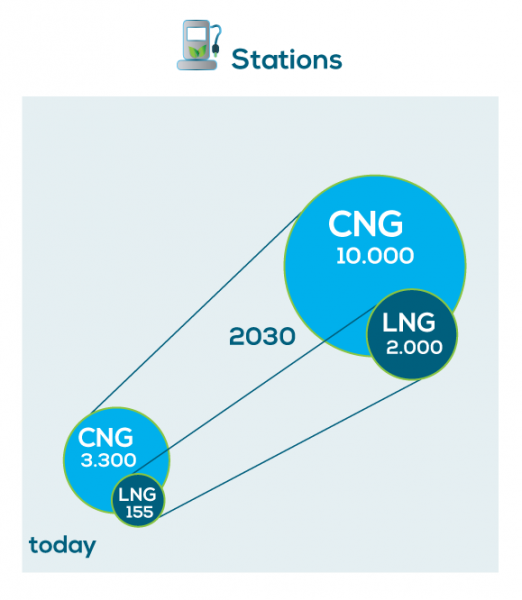 According to the roadmap, the number of LNG stations will increase from the current 155 to about 2.000 across the EU28, whereas CNG stations will increase their numbers around three times, from 3.300 to 10.000. This development will serve to enhance the already existing infrastructure and possibility of low-carbon emissions mobility that natural and renewable gas offer. Furthermore, the investment needed to develop the infrastructure is feasible and competitive when compared with other technologies and therefore would not result in increased costs for the end consumer and only benefits. This article is the fourth publications under the title "Why natural and renewable gas is among the solutions for a clean and decarbonized transport system". Find related publications in the related content section below.